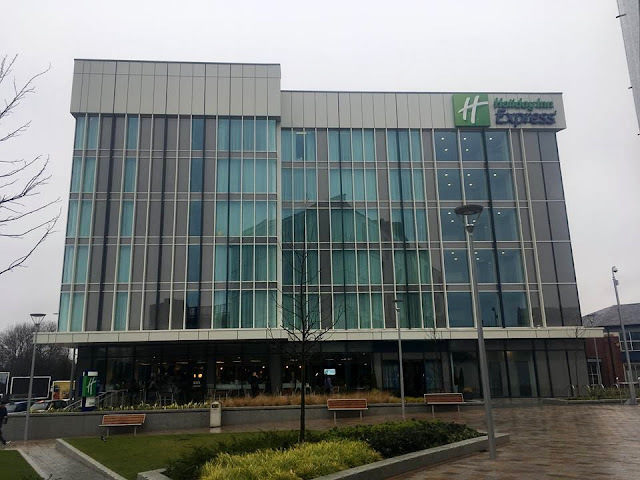 We first became aware of the Holiday Inn Express in Stockport after visiting the area to see The Wizard of Oz pantomime back in August last year. A couple of the cast and crew were staying there and spoke highly of the service they received, so we decided that should we return to the area, we would make use of the hotel and enjoy an overnight visit. 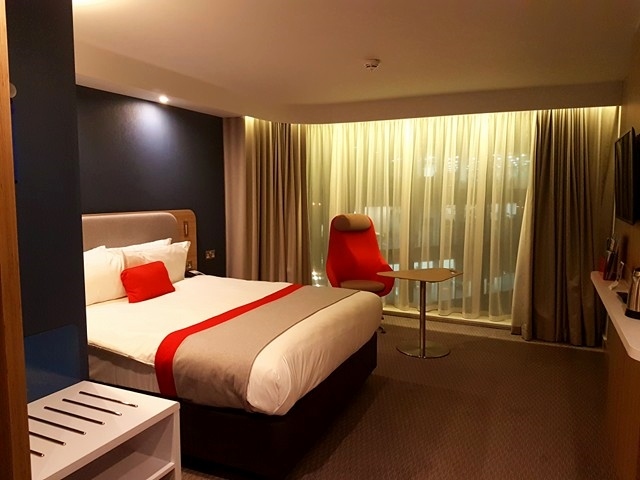 An opportunity arose to watch Jason Manford on his comedy tour on the 2nd February and so we booked a room without hesitation and I am very pleased that we did. The hotel is located right next to the train station and a short walk from the main shopping centre. 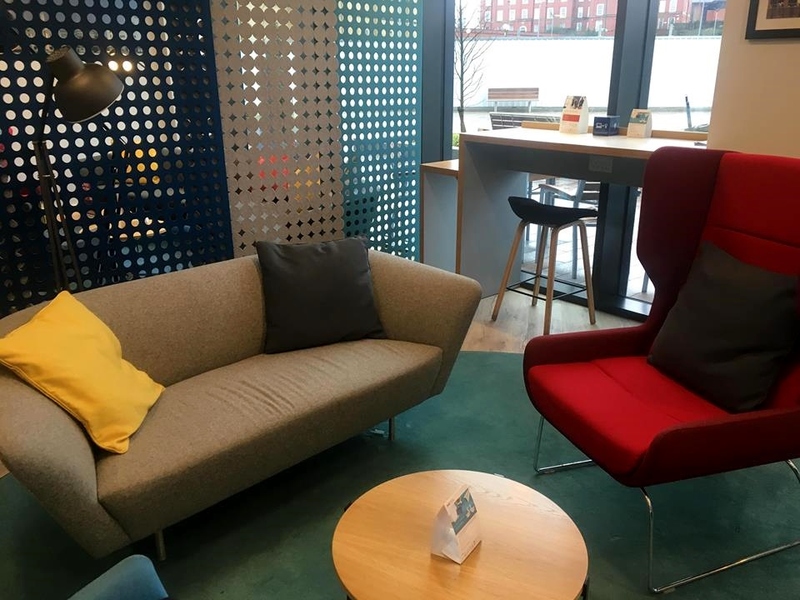 There is also a Sainsbury's local and a coffee shop adjacent to the Holiday Inn Express, as well as a leisure centre a short distance away, where hotel guests can use the facilities at a preferential rate. We booked our stay in a double room a couple of weeks in advance of our visit, for the excellent low price of £51 including breakfast! 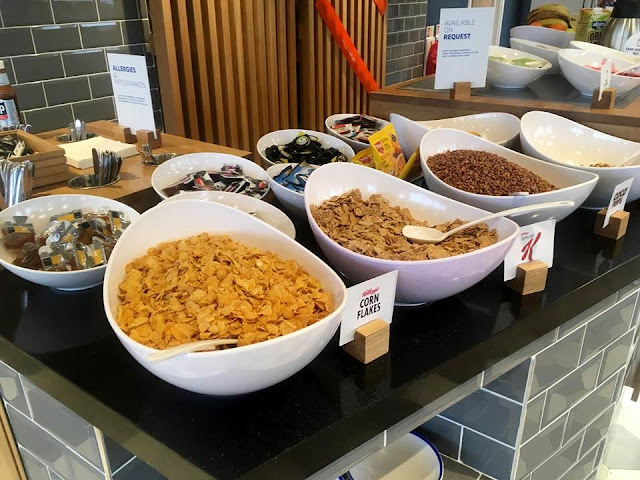 We felt that this was extremely good value for money especially since a breakfast buffet was included, but we were unsure as to how good the hotel would be given the low overnight rate. We needn't have worried though as from the moment we arrived we were extremely impressed with the service, the decor and most importantly our room, which was located on one of the upper levels on floor 5. On arrival we received a friendly welcome and we were told where we could get something to eat in the evening and where to go for breakfast in the morning. We were given clear directions to our room and told that should we require anything, then to ring reception for assistance. Our rate was confirmed and we paid by card on arrival for the stay. I always prefer to pay on arrival as this means no nasty surprises with items charged to the room on check out, so I always pay for the room and then pay card or cash for any additional purchases as we have them. The entrance to the lift area requires you to scan your card by the doors, so this was reassuring to know that only people staying in the hotel could gain access to the rooms and corridors. The lifts were clear glass that ran up the side of the building, so you had a good view over the Grand Central area of Stockport whilst travelling up the floors. As we made our way to our room we were already impressed with the cleanliness and modern interiors that ran throughout the hotel. Everything just looked so tidy, immaculate and well cared for. As we entered our room we were both quite shocked by how large it was. The picture on the website made us think that it would be quite small, but it was in fact really spacious, with plenty of storage areas. There were large floor to ceiling windows that gave us a view over the gardens below and the entrance to the station, as well as a small desk area which was perfect for catching up on emails. It was clean, tidy and well presented, with stylish and modern furnishings. The bedding seemed high quality with a comfortable mattress and pillows. I liked that there were usb chargers on each side of bed integrated into the headboard, so this was ideal for charging our phones overnight. There was a large television on the wall opposite the bed and we enjoyed watching a film later that evening after our trip to the Stockport Plaza. Other conveniences such as a kettle, tea/coffee, iron, ironing board and hairdryer were also provided. We made use of the iron prior to going out and this looked like it had never even been used. The bathroom was spacious, with a large walk in shower. I also really liked the fact that there was plenty of worktop space by the sink, so there was lots of room for my make up when getting ready. Unfortunately I realised shortly after unpacking that I had forgotten my shampoo and conditioner, but a quick call to the reception sorted that out and I was provided with some complimentary miniatures. We had planned to get a bite to eat before heading out to the show, but unfortunately we had got stuck in traffic on our way to the hotel, which meant that we arrived over an hour later as planned. This resulted in us having no time for an evening meal which was a shame. The menu, although not extensive in size, featured a small range of tasty dishes that included Chicken Tikka Masala, Traditional Beef Lasagne and King Prawn Curry. Fortunately, we had plenty of time for breakfast in the morning and after a good nights sleep, we enjoyed the Express Start breakfast buffet in the Great Room. There was plenty on offer and we had a fabulous breakfast consisting of both hot cooked items such as scrambled egg, bacon and sausages, as well as pastries and cereal. The coffee machine was fantastic and we both had a lovely cappuccino, in addition to some fresh orange juice. I couldn't believe how much was available to choose from and it made the £51 we had paid for our room seem even better value than we had originally thought. The staff were constantly busy, making sure all the food items were kept topped up and I noticed that the moment customers left a table, it would get cleared and cleaned immediately ensuring that no guests needed to wait for somewhere to sit. Again the Great Room featured modern furnishings and it was a really nice environment to sit in and enjoy our food. Check out was incredibly easy and was simply a case of us returning our door key card. The receptionist asked if we had enjoyed our stay and whether there had been any problems. This is always nice to see as it means that the hotel is keen to ensure that guests have had a good stay. Customer satisfaction is important and clearly the Holiday Inn Express recognise this in the service they provide. 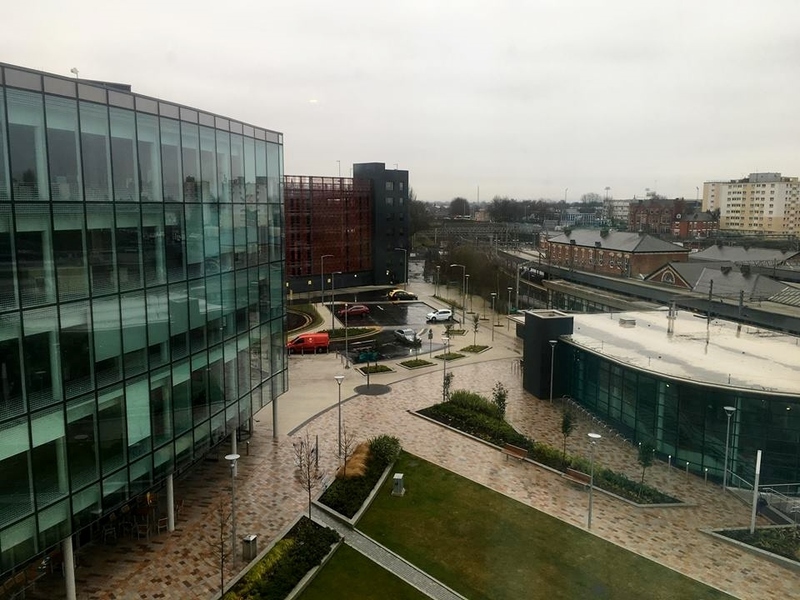 If I was to make one negative comment about the hotel, it would be that there is no on-site parking and instead you need to use the NCP multi storey car park a short walk away. We were already aware of this, so it didn't pose a problem for us, but it is worth noting that if you leave the car park you will need to pay each time you park. Rather than paying a set 24 hour fee where you can come and go as you please, you need to pay on each occasion. This therefore may not be ideal if you are planning a stay and intending to visit places in the local area as parking could end up being quite costly. For our visit it cost £8 (usually £16) but hotel guests are entitled to a 50% discount, so just make sure you remember to get your parking ticket validated at reception before leaving. Whilst my husband and I travelled here as a couple, we will most definitely be returning as a family. 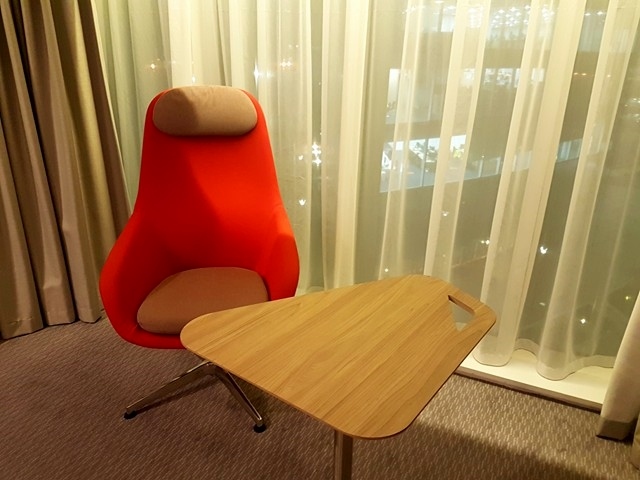 I would say that the hotel is family friendly and also offers interconnecting rooms to provide families with plenty of space. They also have a number of rooms that are equipped with a sofa bed should you wish to only book one room and these can sleep up to 4. In addition to this cots are available to hire free of charge. There isn't a children's menu available, however the express menu offers a range of light bite meals and there are also numerous restaurants within walking distance. *Disclaimer: Opinions and photographs are my own unless otherwise stated. I would always suggest visiting the hotel's own website to obtain the most up to date information.